Attention ewaste recyclers with bins loaded with motherboards / processors, we buy!. We are interested in Pentium Intel CPU processors. Lots containing CPUs wanted! 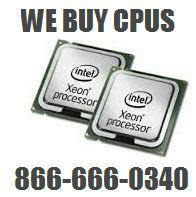 We have the ability to buy Xeon processors that have been cherry picked out of dell and HP servers. Get a quote on server CPU processors. We are CPU buyers. We also buy the processors with missing Capacitors, Transistors. We Buy Xeon E7 processors: E7-8870, E7-8860, E7-8850, E7-8830,E7-8867L, E7-8837, E7-4870, E7-4860, E7-4850, E7-4830, E7-4820, E7-4807, E7-2870, E7-2860, E7-2850, E7-2830, E7-2820, E7-2803.